Maria Adams, Jim Brosnan, Charlie Castronovo, Jane Daniels, John Robinson, Walter Plankl, Anwer Qureishi, and Brian Strasavich. Meeting began at 7:30 pm. Minutes of October meeting were accepted. Financial –Jane reported that we received a $1,000 anonymous donation and circulated a Thank You card to be signed and sent to the generous donor. She already sent out a Thank You letter. This donation will be matched in 2016 with a $500 donation! Jim Brosnan reported that the bank balance at the end of October (after receipt of the $1,000 donation) is $3,070.47. Receipts in October came from donations and t-shirt sales at the Yorktown Street Fair. Expenses incurred in the last month were for a three-panel photo display and the cost of registering our website. The display panels were used at the Yorktown Street Fair and at the Support Connection Walk at the park. Giving Tuesday – The Tuesday after Thanksgiving, December 1, 2015, is “Giving Tuesday”. Jane worked with Mark Kotkin on an announcement/email letter which will be sent out shortly before December 1st. We are asking for funds to purchase seed for wildflowers to be planted in the grassy area of the park along the Taconic Parkway and to pay for some of the bridge expenses. Announcements – Our visibility in the park has increased because Charlie installed 12 additional rack card boxes all over the park. We now have 14. Anwer will contact some of the groups that use the park in the summer, and who indicated on their application forms that they would not mind being contacted by our Friends group, to see if they are willing to volunteer or donate. Dianne and Jane will hang up posters with pictures in the kiosks to advertise our Friends group and the need for volunteers. Thanks to the sign up sheet at the Yorktown Street F­­air, there are 204 people on our e-mail list. Our December 9th meeting will also be our annual holiday party. Recreational Trails Program Grant - The NYS DOT requires signed plans (by a licensedcivil engineer) for the two bridges we are planning to build. NYS Parks is recommending that building the bridges be pulled out of the federal grant and help find money to pay for them. The project to connect with Baldwin Road will be split into two projects: 1. Bridges 2. Gravel and boardwalk. Donations from Giving Tuesday will be used for that purpose. The bridges are being modeled after the bridge built at Hilltop Hanover Farm, for which no engineer signed off on. Viewland Trail - We will be working there again on installing and improving rock steps on November 14th. Jane will schedule more work dates after that depend on the weather conditions. Our insurance premium is due in December. Charlie will check with our insurance company what exactly is covered, including at other events. 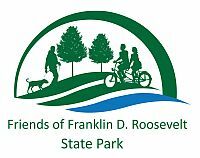 Park Manager’s Minute – Brian confirmed that he will be leaving FDR Park, effective in the first week of January. He has taken a position as Facilities Manager at Saratoga Spa State Park, in Saratoga Springs. Interviews for his position are currently being conducted. Comfort stations in the park have been closed and winterized, except for the one at parking lot no. 1. There are five interested parties to run the concession stands at parking lot 1 and the pool for the next five years. Susan Butterfass has been working on creating a picnic database with the information about who has been using the picnic areas, when, where, etc. It will be easier for next summer’s applicants. She is also updating the social media and the website, showing what the picnic areas look like. There is still no heat in the park’s maintenance garage and will need to use space heaters again this winter. Coy wolves, a hybrid of coyote and wolf live in the park and the deer population may be declining because of them. From afar these coy wolves look like German shepherds and are hard to see. They are not a threat to people since they do not like people. If there are too many people they will relocate. Hunting them has an inverse effect because when a pack is destroyed, the males will start more packs, which will increase the amount of coyotes. The park staff cut a big sugar maple, and the bigger bottom part will be used for a bench and mantle replacement at pavilion 1. They will look exactly the same as the original ones. Jane is still considering having a Friends of FDR Park store at the pool in the summer. We could be selling towels, bathing suits, baseball caps, etc. Meeting adjourned at 9:00 pm. Next meeting will be on December 9th, in the rear of the Park Office, at the Route 202 park entrance.